September 1949: he makes his first appearance on stage at the Nakaza in Ôsaka, playing under his real name in the play "Natsu Matsuri Naniwa Kagami". March 1955: Takao plays at the Ôsaka Kabukiza the role of Sankichi in the "Shigenoi Kowakare" scene of the drama "Koi Nyôbô Somewake Tazuna"; the role of Shigenoi is played by Nakamura Tokizô III. March 1958: Takao takes part in the final Kabuki performance at the Ôsaka Kabukiza [more details]. August 1965: Takao achieves a great success at the Nakaza by playing for the first time the role of Kiso Senjô Yoshikata in the drama "Yoshikata Saigo"; it becomes one of his atariyaku. November 1966: opening ceremony of the National Theatre in Tôkyô with the full length performance of the classic "Sugawara Denju Tenarai Kagami" in which Takao plays the role of prince Tokiyo [casting]. April 1967: revival at the National Theatre of Chikamatsu Monzaemon's drama "Yari no Gonza Kasane Katabira"; Takao plays the role of Iwaki Jinbei [casting]. June 1971: revival at the Shinbashi Enbujô of the drama "Banshû Sarayashiki"; Takao plays the role of Asayama Tetsuzan [more details]. April 1976: revival at the Meijiza of Katsu Genzô III's drama "Ogasawara Sôdô"; Takao plays the roles of Inugami Hyôbu and Koheiji [casting]. April 1977: revival at the Meijiza of Katsu Genzô II's drama "Kimi-wa-Fune Nami no Uwajima"; Takao plays the roles of Ochi Buemon and Gengorô [casting]. February 1979: revision by Uno Nobuo at the Shinbashi Enbujô of Sakurada Jisuke III's drama "Sanzesô Nishiki Bunshô"; Takao plays the role of Rokusa [casting]. Summer 1985: tour in the USA; Takao plays the roles of Kamo no Jirô, Yoemon and Gonsuke/Seigen in "Shibaraku", "Kasane" and "Sakurahime Azuma Bunshô", which celebrate the shûmei in the USA of Ichikawa Danjûrô XII [more details]. June 1986: Takao and Bandô Tamasaburô, a very popular and successful duo, play together in Paris (France) in the classic "Narukami"; Takao plays the role of Narukami and Bandô Tamasaburô the one of princess Taema. June 1989: the drama "Kaidan Botan Dôrô" using Ônishi Nobuyuki's script is staged for the first time with a full Kabuki casting, at the Shinbashi Enbujô; Takao plays the roles of Tomozô and Hagiwara Shinzaburô [casting]. December 1992 ~ December 1993: a serious illness prevents Takao from performing for a year. January 1994: Takao is back on stage at the Kabukiza, triumphantly performing in the dance "Omatsuri". January 1998: Kataoka Takao takes the prestigious name of Kataoka Nizaemon XV at the Kabukiza, playing the roles of Matsuômaru and Fujiya Izaemon in the dramas "Terakoya" and "Kuruwa Bunshô". February 1998: Nizaemon celebrates his second month of shûmei at the Kabukiza, playing the roles of Kumagai Jirô Naozane and Sukeroku in the dramas "Ichi-no-Tani Futaba Gunki" (Kumagai Jin'ya) and "Sukeroku Kuruwa no Hatsuzakura". April 1998: Nizaemon celebrates his shûmei in Ôsaka at the Shôchikuza, playing the roles of Matsuômaru in "Terakoya" and Kameya Chûbê in the "Fûin Giri" act of the play "Koi Bikyaku Yamato Ôrai". May 1998: Nizaemon celebrates his second month of shûmei at the Shôchikuza, playing the roles of Fukuoka Mitsugi and Sukeroku in the plays "Ise Ondo Koi no Netaba" and "Sukeroku Kuruwa no Hatsuzakura". October 1998: Nizaemon celebrates his shûmei in Nagoya at the Misonoza, playing the roles of Fujiya Izaemon and Sukeroku in the dramas "Kuruwa Bunshô" and "Sukeroku Kuruwa no Hatsuzakura". 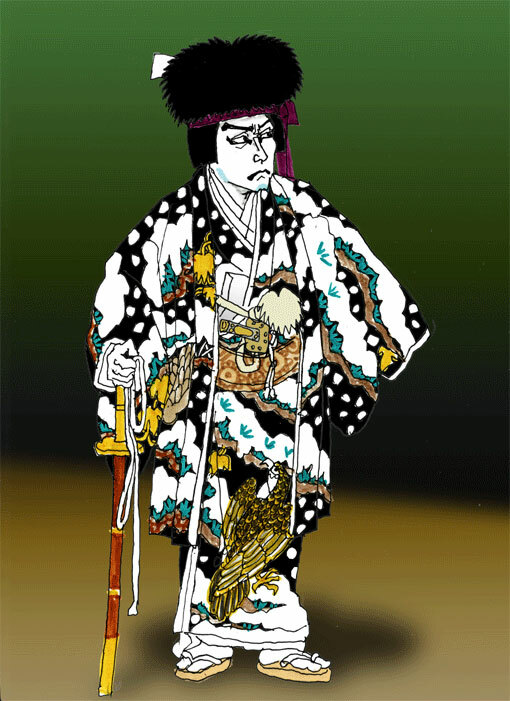 December 1998: Nizaemon celebrates his shûmei in Kyôto at the Minamiza, playing the roles of Fujiya Izaemon and Kumagai Jirô Naozane in the dramas "Kuruwa Bunshô" and "Ichi-no-Tani Futaba Gunki" (Kumagai Jin'ya). February 2000: Nizaemon celebrates his shûmei in Fukuoka at the Hakataza, playing the roles of Matsuômaru, Mashiba Hisayoshi and Kameya Chûbê in the dramas "Terakoya", "Sanmon" and "Fûin Giri". 15 December 2006: Nizaemon joins the prestigious Japan Art Academy (Nihon Geijutsuin). July 2015: Nizaemon receives the prestigious title of Living National Treasure (Ningen Kokuhô in Japanese). Living National Treasure Kataoka Nizaemon XV is an amazing tachiyaku and one of the most popular contemporary actors. Do not miss him when he performs in duo with the onnagata actor Bandô Tamasaburô.